← Size Matters (Part 2): Giant Medieval Manuscripts! Living without modern entertainment luxuries, what did medieval people do for fun? Surely it wasn’t all farm labour, praying, or jousting (to play into common misconceptions)? Believe it or not, several of our favourite board games originated in the Middle Ages. How do we know what medieval game enthusiasts were playing? Well, they occasionally wrote down their game rules in manuscripts, including pictures of plays and boards, and illustrated themselves playing games. We know that game-playing was the mark of gentility at princely courts and also a pastime for gamblers, that games were invented by clerics and played by saints, and that soldiers had whiled away their time with games since Ancient Roman and Greek times. As is the case today, in the Middle Ages games were probably enjoyed by anyone with a bit of leisure time and knowledge of the rules. Chess was likely invented in India sometime between 250 and 550 CE. It became popular in Islamic Persia in the mid-7th century, and moved north into 10th-century Europe via Muslim-Christian contact in the Iberian Peninsula. Known in the Arab world as shatranj, southern European players modified the game around 1200. It reached today’s form (more or less) in about 1475, and with the growing popularity of chess rule books, became increasingly standardized in the Western world. 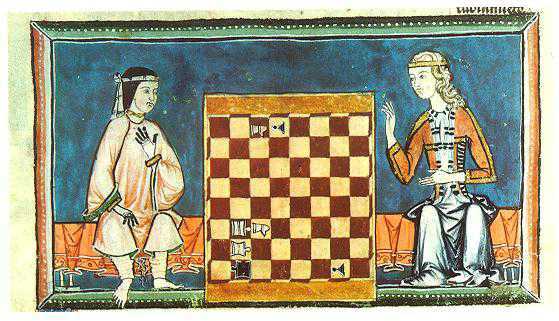 Our best testament to medieval chess is the Libro de los Juegos (Book of Games), commissioned in 1283 in Toledo by Alphonso X of Castile. It contains 150 miniatures (notably showing women, men, royalty, peasants, Christian monks and nuns, Muslims, Jews, young, and old) and instructions for playing three games: one of skill (chess), one of chance (dice), and one of both skill and chance (backgammon). It also approaches the games from astrological, astronomical, and allegorical perspectives. The Manesse Codex, a Middle-High German song and poetry book containing the works of about 135 Minnesingers (writers of German Minnesang), was written in Zurich, c. 1304-1340. Created for the wealthy Manesse family, its illustrations often feature noble men and women at leisurely play, including games of both chess and backgammon. 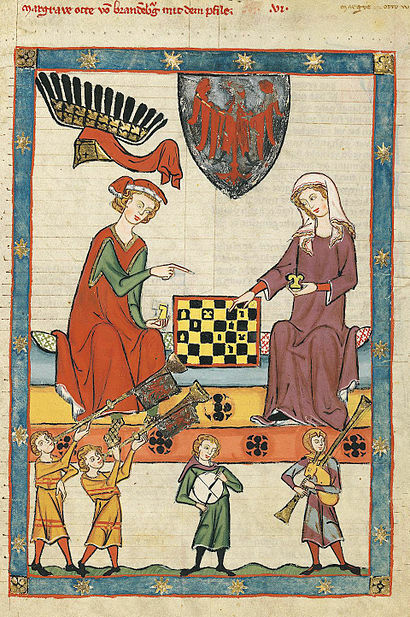 Here Margrave Otto IV of Brandenburg plays chess with his lady. Manasse Codex, Große Heidelberger Liederhandschrift, Cod. Pal. germ. 848, f. 13r. Heidelberg University Library. 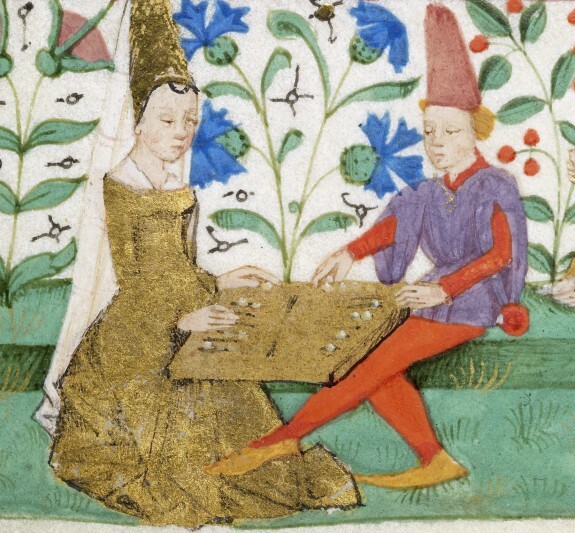 A bored-looking French couple plays a particularly dull game of backgammon in the bottom margin of a Book of Hours, c. 1460. Walters Art Gallery, Ms W 269, f. 16r. Variations of backgammon are even older than those of chess! Excavations at Shahr-e Sukhteh in Iran have unearthed a backgammon set from 3000 BCE, although the earliest rule book dates from the 6th-century CE Sasanian court. It pops up in Ancient Rome as Ludus duodecim scriptorum (Game of Twelve Lines), and again in Byzantium at the late-5th-century court of Emperor Zeno. It also enjoyed early medieval popularity in China and Japan. 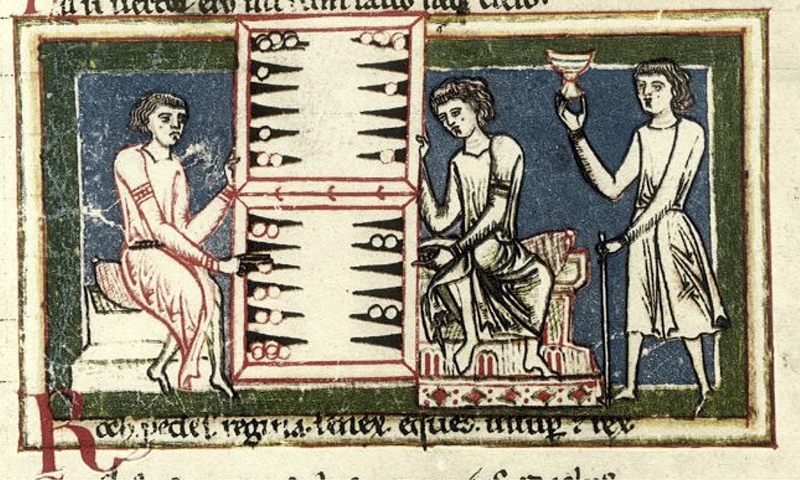 In the medieval west, backgammon-type games called Jeux de tables (Games of Tables) became popular gambling vehicles in 11th-century France. Given this ‘roguish’ reputation, (Saint) Louis IX prohibited table games among his court and subjects. No matter – backgammon caught on in 12th-century Germany, and even reached Iceland over the next hundred years. 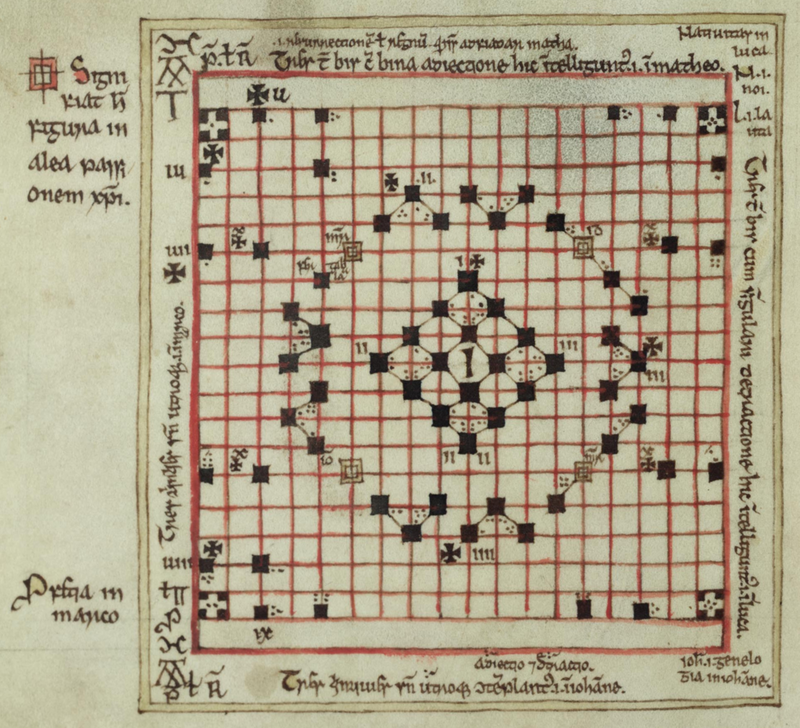 As mentioned above, Alfonso X’s 13th-century Libro de los Juegos discusses it as a game of both skill and chance, alongside chess and dice games. The Carmina Burana is a collection of songs, often satirical, likely composed by rebellious Goliards. It contains Latin, German, and French, in two hands writing c. 1230. Here, accompanying a song about an imaginary order of lazy, gluttonous, game-playing clerics, a group of men play a backgammon-type game. Chess is also depicted. Here, again in the Manesse Codex, a certain Herr Goeli of Baden plays backgammon. Große Heidelberger Liederhandschrift, Cod. Pal. germ. 848, f. 262v. Heidelberg University Library. Have you ever played “Breakthru“? It’s based on a popular family of ‘table’ or board games, Tafl (hnefatafl in Old Norse), similar to today’s chess. Tafl was a two-player game with pieces representing kings and their men, the goal being, of course, to capture your opponent’s men and eventually his king. Tafl variants were played throughout Germanic, Celtic, Anglo-Saxon, and Scandinavian lands since at least 400 CE, until overtaken by chess around 1200. According to the Orkeyinga saga, Rögnvald Kali Kolsson (aka St Ronald of Orkney, d. 1158) was a top-notch hnefatafl player. Alea evangelii (Game of the Gospels) is described and pictured in Oxford, CCC MS 122 (f. 5v pictured). This 11th-century Irish manuscript suggests that this version of Tafl was created at King Æthelstan’s court by an unknown scholar named Frank and Israel the Grammarian. The diagram contains a mix of Latin and Old Irish captions. Close-up and enhancement of the replica of the Ockelbo Runestone, Sweden. 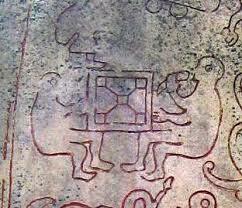 In this scene from the Sigurd legends, two men play hnefatafl. 10th? century, destroyed by a church fire in 1904. For more on medieval games, take a look through the new Walters Art Gallery Exhibition ‘Checkmate!’. If board games aren’t your thing, the medieval roots of other pastimes, like golf, football (soccer), and hurling might be up your alley. Technology aside, many of the simple, social ways we have fun appealed to medieval people, and like us, they wrote books about it. 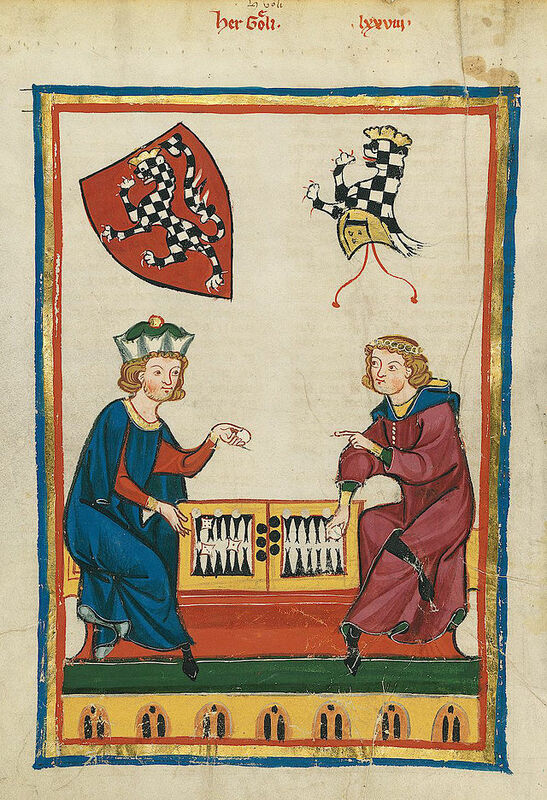 This entry was posted in Jenneka Janzen and tagged backgammon, chess, Court, Manuscript, Manuscript Marginalia, medieval games, Medieval Illumination, tafl. Bookmark the permalink.